The biggest highlight and perhaps the most sought after feature of Apple’s latest mobile OS has been the inclusion of third-party keyboards. Apple has traditionally kept a very closed ecosystem around its software features with no inclusion of any system wide applications. If you weren’t a fan of default keyboard, you had no option but to turn toward jailbreaking your device. Considering jailbreaking isn’t a happy game for every consumer, the iOS largely kept its users stuck with a singular keyboard. However, it is changing with the latest iOS 8 bringing in some lovely and more efficient keyboards previously taking accolades on Android platform. The cherry, however, has proved to be the ingenuity of third party developers who are taking the keyboard to higher levels and offering some quirky features like a GIF keyboard! Millions of people have already downloaded the third-party iOS 8 keyboards after the release of the OS only last week. It shows the enthusiasm with which Apple fans took the possibility of using completely new keyboards. The tops iOS 8 keyboards have been the top Android keyboards, not surprisingly, with SwiftKey, Fleksy, and Swype taking the lead. While keyboards offer many emoji options, however, nothing wins over the charm and wit of GIFs that have become an integral part of our current web presence. 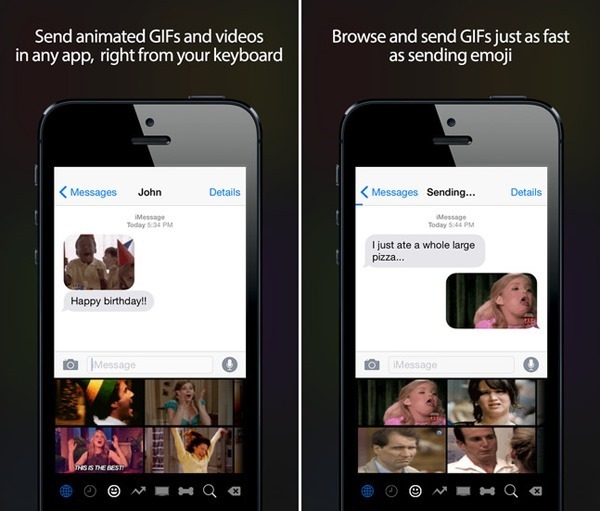 The first and most popular GIF keyboard for iOS 8 is termed as Riffsy and is offered for FREE. You are going to love this keyboard if attaching a GIF image in every conversation is what you love doing. Don’t annoy others too much with GIF images though – if we should let you in a little secret of ours, there is no level of too much. You can download the Riffsy GIF Keyboard for iOS 8 for free and enjoy the vast possibilities of making a conversation lively. Thousands of GIFs are already included in this GIF Keyboard for iOS 8, however, you can also add your own if you would live to.